I can hardly wait for grilling weather. There is something about the smell of meat cooking on a grill, oye, it is so good. 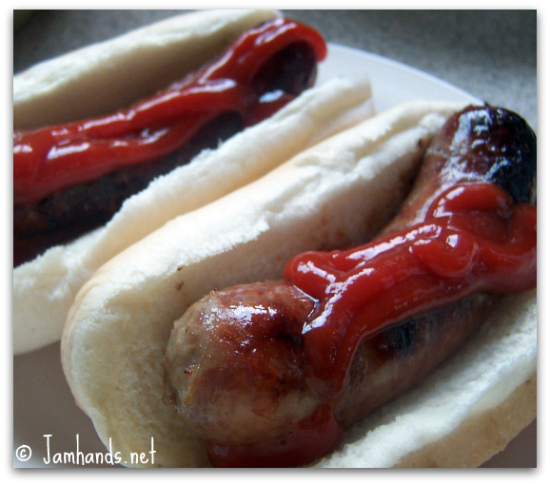 If you want to jazz up the standard brat, try out these delicious grilled beer brats. 1. Prepare grill before starting. 2. In a large pot, add sliced onions to the bottom of the pot. Top with bratwurst and add beer. Bring to a boil and let simmer for 15 minutes. Remove brats and onions. Discard liquid. Set aside onions if using. Transfer brats to grill. Grill several minutes on each side, or until done. Source: my dad! Just kidding. This is how I grew up on brats. Everyone we knew made them this way. I'm always surprised to find some people don't do it like this. Most German-Americans seem to first boil them in beer and onions and then grill them, so I doubt there is a single "source." :) And the bonus of boiling them in beer? If you forget to thaw them out, you can boil them longer and get them cooked anyway. I had a little fun talking about your blog. I do appreciate all of the hard work you have done and the look of your blog. Any comments you might find just a little mean spirited were actually made in appreciation of your tip. Sometimes funny does not always show up on blogs as well as we wish... !! !